The Whitman Hanson girls’ soccer team advanced to the quarter finals in the division 1 south tournament with a 3-1 win over Wellesley. Despite their offensive pressure the Panthers were unable to score in the first half. In the second half Olivia Borgen got the Panthers on the board when she took a cross from fellow freshman Kelsee Wozniak and slipped it behind the keeper. Freshman Nora Manning doubled the lead shortly after when she took an Anika Floeck feed and tucked the ball in to the back of the net. With 2 minutes remaining Wellesley got a goal back and then Senior Samantha Smith closed it out with a blast from 25yds out. The defensive unit of Sam Perkins, Courtney Woodward, Erin Wood and Olivia Johnson were outstanding for Whitman Hanson. Alexis Billings and Ava Melia also had strong games in the midfield. Keeper Skylar Kuzmich made 6 saves in goal. The Whitman Hanson girls’ soccer team wrapped up the regular season with a hard fought 2-1 victory over non-league opponent Norwell. Norwell took a 1-0 lead midway through the first half and carried that until half time. The Panthers came out flying in the second half and got the equalizer when Anika Floeck put home a rebound off a Samantha Smith free kick. Olivia Borgen got the game winner when she took a perfectly placed pass from Zoe Cox and beat a Norwell defender before placing the ball in the back of the net. The defense of Courtney Woodward, Sam Perkins, Olivia Johnson and Erin Wood were outstanding all night in keeping the potent Norwell offense in check. Zoe Cox, Alexis Billings and Kelsee Wozniak were outstanding in the win. The Panthers finish the regular season at 13-1-4. The Whitman Hanson girls soccer team wrapped up Patriot League play with a 1-0 win over Duxbury. Whitman Hanson scored in the first half when Nora Manning took a Riley Bina pass and beat the Duxbury goalkeeper. The Panthers defense took over from there and kept the Duxbury offense from any strong chances. Courtney Woodward led the defense with the help of Sam Perkins, Erin Wood and Olivia Johnson. Samantha Smith had an outstanding game in the midfield for the Panthers. Keeper Skylar Kuzmich made 10 saves to record the shutout. 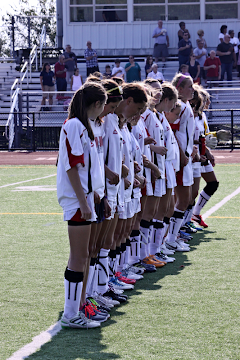 The Whitman Hanson girls battled Hingham to a 1-1 Patriot League tie. Hingham scored in the first half and the Panther’s Riley Bina took a Kelsee Wozniak cross and fired a one timer in to the top left corner to tie the score. Whitman Hanson continued to apply pressure but were not able to get the go ahead goal. Sam Perkins, Olivia Johnson, Erin Wood, Courtney Woodward and Samantha Smith had outstanding games for the Panthers. Keeper Skylar Kuzmich made 8 saves in the goal. The Panthers are now 10-1-4 on the season. The Whitman Hanson girls’ soccer team prevailed 5-1 in a non-league game with Rockland. Whitman Hanson’s Kelsee Wozniak scored two quick goals in the first half and the Panthers never looked back. Zoe Cox, Riley Bina and Emily Blake all added single tallies to account for the scoring. Keepers Skylar Kuzmich and Reese Codero split the duties in net. Courtney Woodward, Sam Perkins, Olivia Johnson and Erin Wood had strong defensive games. The Panthers are now 10-1-3. The Whitman Hanson girls soccer team defeated Patriot league rival Silver Lake 2-1. The Panthers got on the board with 5 minutes to go in the first when Riley Bina took a Zoe Cox cross and fired a left footed shot into the side of the net. Silver Lake tied it up just before halftime. Whitman Hanson continued to apply pressure when Erin Wood picked up a loose ball and fired it into the net for the game winner. Whitman Hanson had 19 shots on goal and many were turned away by the Silver Lake keeper. Samantha Smith, Courtney Woodward, Sam Perkins and Erin Wood were strong defensively for the Panthers. Kelsee Wozniak, Nora Manning and Alexis Billings all had strong games. Keeper Skylar Kuzmich recorded 8 saves for the win. Whitman Hanson is now 9-1-3 on the season.